This past weekend my roommate from college was here and my husband and I decided to keep her company on her way into NYC. She grabbed her subway to jersey and we were unleashed into the city. The best part of the city is that if you walk for a long enough period of time you will stumble upon something awesome. As we meandered to the city we made ourselves to Lion Brand Yarn Studio. The original intent of my trip was to pick up Lion Brand’s Stainless Steel Wool to use as an experiment. 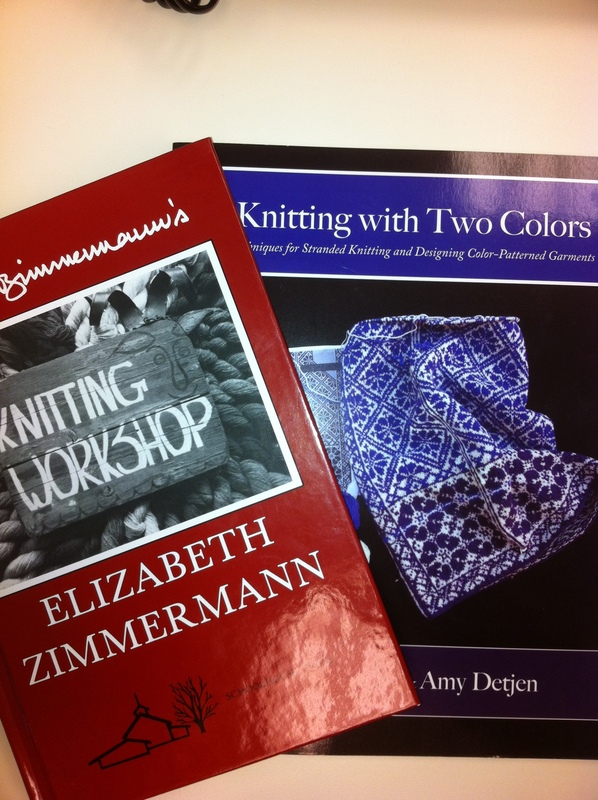 But then as I wandered around the shop I found a jewel….. Elizabeth Zimmerman’s Knitting Workshop. I has already bought Knitting Without Tears and couldn’t wait to tear into this book. I always wondered why everyone was so enamored by her and her books. But until you read one you will never know. My favorite is how she teaches you to be independent of patterns and understand how garments are constructed. 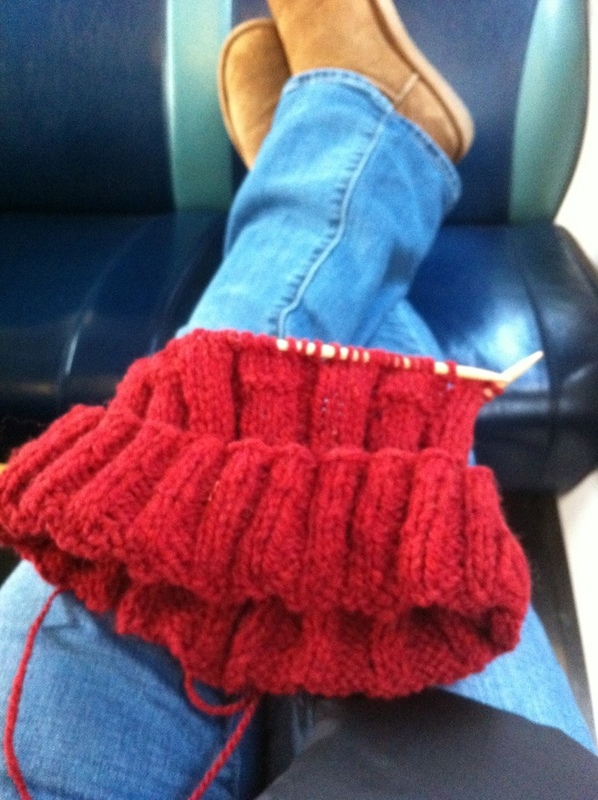 The big eureka moment for me in this book was Elizabeth’s percentage system for knitting sweaters. For me this was revolutionary. I have taken a lot of design classes and we talk about how long and why but the percentages are revolutionary. So my challenge to you today is to just pick up one book and tell me how long it was before you put it down. I’d love to hear your stories about Elizabeth! So what relaxes you at the end of a stressful seemingly productively unproductive day… Knitting of course I know but what else… Reading about knitting you got it! I just returned home and I wanted to sleep bc I was exhausted yet I was wound because of an earlier conversation about politics which I normally enjoy but bc I was tired and exhausted I did not have the usual mental fortitude to make my case. So after a short jaunt on google about topics discussed I found myself cleaning a task I don’t normally like to do but bc I was too wound to go to I was awaiting my daughters laundry to be ready to be switched I was cleaning fervently. 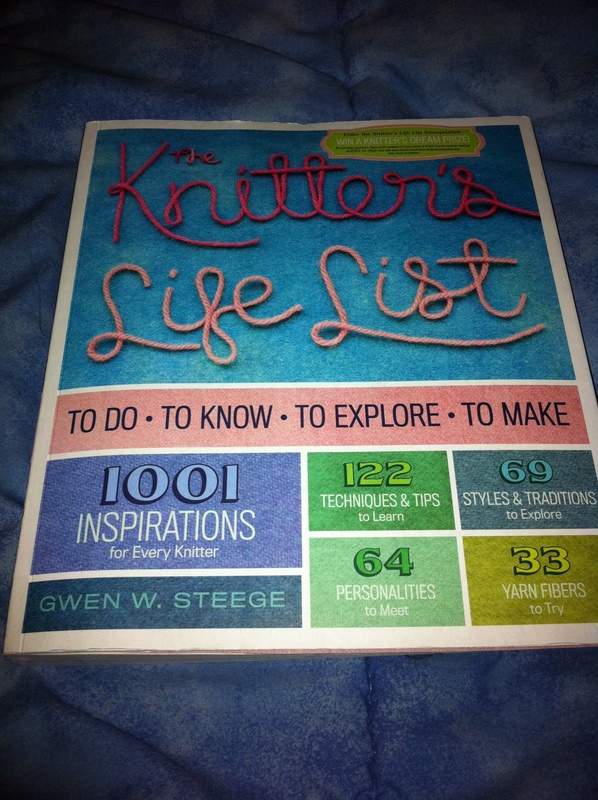 I just got a new desk so I was so excited when I realized where I wanted my knitting books I started to search for them and out of the woodworks came “The Knitters Life List” by Gwen Steege which by the way also has a great book about knitted stockings. I fervently flipped through the book as I was getting reacquainted with an old friend. I was in search of more things to mark off as well because of my recent trip to Vogue Knitting Live in January! So I looked through the chapters and the life lists and was able to add things I wanted to learn as well as check off some personalities I had met! I had met Vicki Howell and Debbie Stoller check!!!! They are both lovely btw and in the pics through our the book I happened to recognize that there was a picture from the Rhinebeck Sheep and Wool Festival and even better cheesy I know but I recognized the Green Mountain Spinnery booth! The funniest part is that I looked more closely to see if I knew anyone in the pic as I love their yarn and have talked shop with them at length I realized that both Maureen and Margaret were in the picture in the book as well! It’s a super small wooly world out there!!! Thanks everyone for reading!!!! That blog was amazingly calming to write… Maybe next time I will finish my review! Lol!